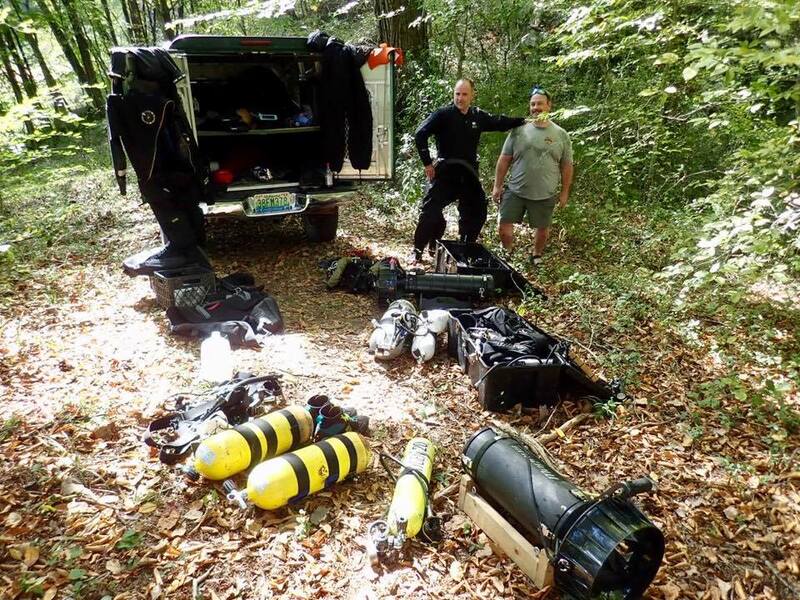 Jason Richards (in KISS Sidewinder) and Terry Hall return from a 2500 foot dive into Jasper Blue to check line integrity. With no rain for the last few weeks, the water caves in Southern Tennessee were looking good. For the time being, anyway. Our first stop was to check the line integrity at Jasper Blue spring in Jasper, Tennessee, currently the longest underwater cave in TN. Due to rains and deployments, I have not been in the water there in the last three years, so we needed to see what sort of condition the line was in, for further exploration this fall. Chrissy and Ryan Hoffman decided to try to take video in the front, as this was Ryan's first visit to the cave. The visibility was not good enough (10-15 feet) for video, but they did get to swim 1000 feet upstream and check out the cave. Terry Hall and I continued upstream to the dome room area, and found the line to be in great shape, and only covered with sand in a couple of places! Below is a video of the dome room area in 2012 by Ben Martinez. Chrissy gets ready to do battle with the cave creatures! This was a great dive for the KISS Sidewinder, and the Submerge Valkyrie!